"My husband has proclaimed it one of my best purchases ever!" My husband was looking for a way to get fresh water to our dog out in the field while bird hunting. His requirements of not too heavy, bulky and be self contained so that water would no slosh out in the truck. I couldn't believe my luck when I found this dog waterer. My husband has proclaimed it one of my best purchases ever! GSP & Irish Setter. Hunts. Needed a bung(easily obtained from Ace) to keep water from splashing when in transit. Hard to improve upon for making water available when needed and conserving when not. "It keeps the dirt out of the water and keeps the water clean." I love this waterer. It keeps the dirt out of the water and keeps the water clean. "Awesome product. Keep it in the truck at all times." Awesome product. Keep it in the truck at all times. Easy to flip up; let the water drain back in. I don't end up wasting so much water. "We have tried several different automatic waterers in the past. I would highly recommend this to anybody!" We have tried several different automatic waterers in the past. This is the only one we are satisfied with. It is virtually indestructible and impossible to tip over. I would highly recommend this to anybody! "Good product, well built, durable." It just needed a plug to keep it from leaking during transit. Otherwise there's always water when the dogs need it. Good product, well built, durable. Great idea. Could be made so much better by supplying a rubber stopper with a stainless steel eyebolt and tether cord, so you can transport a full container without spilling, and also to keep dirt out of the clean water. If you spend this much for a funny shaped plastic bottle, it should be the best piece of plastic you can engineer. Love it! Convenient, travels well, and large capacity! "Absolutely great, and I highly recommend it. Use it every trip." The waterer itself is absolutely great, and I highly recommend it. Use it every trip. "The best waterer you can have in your kennels"
The best waterer you can have in your kennels, or take to a hunt to make sure your dog has clean water to drink. Works great and large enough to hold enough water for 3 hard working hunting dogs! "All in all, it is great"
All in all, it is great but, there needs to be a way to clean the inside. "I always recommend it to others and have bought some as gifts." I've used the drinking spot for three years. It has stood the test of time, weather, and the elements. I always recommend it to others and have bought some as gifts for friends. I can easily water both dogs during hot days. "I love this product and plan to order a couple more." One of our pheasant hunting guests brought a drinking spot for his dogs, and I knew I had to get one. It is a wonderful product for carrying water for dogs while traveling and working in the field. No more bowls, caps, lids, buckets or jugs of water to keep track of. I love this product and plan to order a couple more. Perfect for hunting trips. Doesn't spill, and dogs drink just fine from it. No plug to lose. Excellent, but an improvement would be a plug to keep the water from sloshing out during transport. "Great for hunting, training and testing." Great for hunting, training and testing. Good product,my dogs like,good out in the field. Could use a drain plug to get old water out and rinse it. "The durability of this product is excellent!" The durability of this product is excellent ! The amount of water it holds, 2 gallons is perfect, and the weight is just right. There are two things I would change, and these are by no means deal breakers for me owning this product. I am very satisfied! I would make different colors, blaze orange is what would appeal to me, and also maybe a little trap door on the top that would ease in removing any debris that got in side of the container. This would also help in the cleaning or washing out of the container, as well as if people do not keep clean water in these, or keep them in the sun in the kennel as a main source of watering dogs. They can build up harmful bacteria. That's my two cents. Thanks for the opportunity to speak. Keep up the good work. Sincerely Nick Hendrickson, FF/EMT-P, Minnesota. 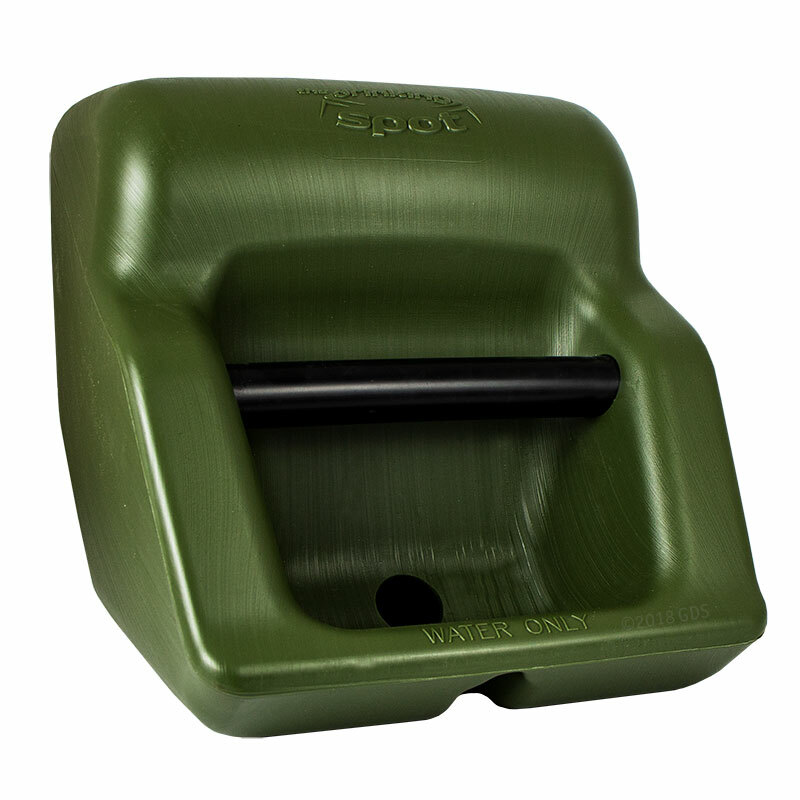 This waterer is great for the field. It is easy to tote around for a hunt and works great at home to ensure my dog always has water available. Highly recommend. Chesapeak,Visla,Brotish Lab. Hunts. Family pet. Real handy. It could use a plug to prevent spillage while bouncing down dirt roads. Great product. "Perfect for the field and traveling." Convenient, light, and serviceable. Perfect for the field and traveling. Works great. One improvement, I'd like to get a cork to seal it when moving. A little water sloshes out and dust can get in. "Love the waterer and super easy ordering process! " Love the waterer and super easy ordering process! Great company to deal with! Thanks. "This is my second, and I'm hopeful that the handle on this one does not start popping out, as the last one did." This is my second, and I'm hopeful that the handle on this one does not start popping out, as the last one did. If it does, I'd welcome a recommendation for a strong plastic adhesive to keep it in place. Works well, and provides a good amount of water in reserve to last on hot days. "Needs a higher lip around drinking trough." Needs a higher lip around drinking trough. Spills a lot as it is. Messy. It's a bit messy. Water spilled onto the floor if I filled it full. We have put a towel under it to catch the overflow. For larger dogs, the drink opening and container volume should be increased. Otherwise, very good product that keep trash and mosquitos out of dogs water. "Easy to use, but needs a plug when in transit." Easy to use, but needs a plug when in transit. Dogs seem to like it. "Love this for multiple dogs"
"This is a great waterer that I can toss in the back of my truck for a working session or a week long trip." English Pointer. Hunts. Family pet. Competes. This is a great waterer that I can toss in the back of my truck for a working session or a week long trip. It holds plenty for multiple dogs, and has held up for a few years now. I liked it so much I have given them as gifts. The reason for Good not Excellent â€“ I would like a way to clean it. "Much better than using a regular bowl." Much better than using a regular bowl. At the tailgate, lot's of times the dog doesn't drink and you dump the bowl out before heading to the next covert. I love the ability to tip it back up and go. One improvement would be to include a stopper for the hole to keep the water from sloshing out in the back of the truck. It took me forever, but I finally found a tapered rubber stopper that fit at a farm supply store. The Drinking Spot waterer is a very good product. "Do not overfill this waterer or when you turn it upright will pour out all over! " English Cocker and Terrier mix. Hunts. Family pet. Do not overfill this waterer or when you turn it upright will pour out all over! Should have come with a cup with the proper amount to fill it because you really cant tell how much is in it until you turn it. "It holds a lot of water, has no moving or removable parts and is extremely durable. " It holds a lot of water, has no moving or removable parts and is extremely durable. The only issue is spillage in a moving vehicle. I found a plastic dishpan which fits snugly around the Drinking Spot and the problem was solved. I would definitely recommend it to a friend, in fact I have done so more than once. "It is great with the exception of a lid. I ended up buying a cork and cut it to fit, so the back of the truck isn't soaking wet when I travel." It is great with the exception of a lid. I ended up buying a cork and cut it to fit, so the back of the truck isn't soaking wet when I travel. "I love it when traveling with the dogs for water stops along the way because it will hold water when stored upside down." Yellow Lab and Chocolate Lab. Hunts. Family pet. "Good product. Wish it were easier to clean." Good product. Wish it were easier to clean. "They're especially useful when I have several dogs or if I'm moving often." I have two Drinking Spots and take them with me often. They're especially useful when I have several dogs or if I'm moving often. They're unlikely to get knocked over like regular dishes. In parades I place the DS in front of each dog when we stop and then quickly put it back in the wagon without spilling/wasting water. I just wish that the DS had an access port so I could easily clean it. The open area for the water to sit isn't as big as the pictures makes it look like. But other then that, it does work great and holds lots of water. "Dog doesnt like to drink out of it with handle." Dog doesnt like to drink out of it with handle. "The drinker is hard to completely empty out and therefore difficult to clean." The drinker is hard to completely empty out and therefore difficult to clean. It also leaks out while driving in the car. We get around this by stuffing a towel under the handle to plug up the opening. "The drinking area is small." The drinking area is small. My dog actually laid down when getting a drink and water replenished slowly. The product functionality worked. "Nice capacity, but the dogs turn it over too easily." Nice capacity, but the dogs turn it over too easily. Why not offer a version with a bracket that can attach to a wall or fence? "Leaks water if not level." Leaks water if not level. When in my hunting areas level ground is hard to come by. "I like how sturdy it is"
I like how sturdy it is, however, it would be nice to have a plug or way to prevent the water from leaking out when traveling. Jack Russell Terrier. Hunts. Family pet. Competes. I found it difficult to clean. The male dogs will pee in the tray and ruin the water. I didn't favor it for long term use. Might be ok for a trip in the field but not good for everyday use. Being solid color you can\'t tell the water levels nor if the interior is clean or not. I had a great travel waterer and left it at a hotel. I bought this one as a replacement. There are no stoppers and lots of holes that leak water in transit. My lab makes an awful mess trying to drink out of it in my garage. I have gone back to a bucket and 1 gallon jug. Perfect for hunting trips, kennels, recreational travel, backyard use, obedience schools, and more. The Drinking Spot is an outdoor gravity-fed pet watering system perfect for hunting trips, kennels, recreational travel, backyard use, obedience schools, and more.